Two passionate prospect development professionals respond to some criticisms of donor-advised funds. Certain Apra members who choose to go above and beyond in the prospect research field are recognized with the annual Apra Awards. We feel these inspiring overachievers have a lot to teach us, so we decided to pick the brains of the 2018 winners in a new interview series. Should you use the International Consortium of Investigative Journalists’ database to research your prospects? The Ethicist weighs in on the ethics of using information that wasn’t intended to be public. Learn what Apra chapters have been doing this quarter, and discover upcoming events you can pencil into your schedule. Active Apra member Natalie Larmon sadly passed away on Oct. 31. Here, her colleagues remember her impact. You may have heard the U.S. Federal Election Commission has rules regarding permissible uses of its political contribution data. Are you violating those rules? The Ethicist weighs in. Prospect development is an incredibly important feature for any organization relying on donations for its operations. Make sure you know the basics of prospect development and its uses for nonprofit organizations. Learn what Apra chapters have been doing this quarter, and discover upcoming events that you can pencil into your schedule. For someone on the outside looking in, prospect research can seem invasive. How can we convince folks that prospect research is valuable and ethical? The Ethicist weighs in. Ask the Ethicist: Is Sharing Caring? Is it ethical to share what you know about a prospect you knew from a prior organization with your current organization? The Ethicist weighs in. If your Big Time Principal Gift Prospect is charged with illegal activity, how should you proceed? The Ethicist weighs in. Two longtime presenters share their best tips for speaking, along with why they do so in the first place. We spoke with Renée M. P. Teate, data scientist and keynote speaker at this year’s Apra Data Analytics Symposium, to learn why data science is important to the field of prospect development. In order to gain a crucial deep understanding of a prospect, these are the questions you need to ask. Ask the Ethicist: Using Net Worth in Research Profiles? Is it ethical to use net worth in a research profile? If so, when and how? The Apra Ethics & Compliance Committee weighs in. In honor of Apra's 30th Anniversary, the Connections team has reached out to Apra members who have dedicated years to the organization, and asked them a few questions regarding all things Apra: past, present and future. This week, hear from longtime Apra member Jacqueline Robbins. All over, Apra chapters are organizing events that highlight industry innovation, information and connection. Learn what Apra chapters have been doing this quarter, and discover upcoming events that you can pencil into your schedule. The Apra Body of Knowledge (BOK) is a comprehensive tool that helps individuals and their managers identify growth opportunities and ensure they have the knowledge and resources to excel. Learn how several Apra members are utilizing the BOK in their roles and organizations. Under what conditions is it acceptable to share information? The Apra Ethics & Compliance Committee weighs in. In honor of Apra's 30th Anniversary, the Connections team has reached out to Apra members who have dedicated years to the organization, and asked them a few questions regarding all things Apra: past, present and future. This week, hear from longtime Apra member Helen Brown. In honor of Apra's 30th Anniversary, the Connections team has reached out to Apra members who have dedicated years to the organization, and asked them a few questions regarding all things Apra: past, present and future. This week, hear from longtime Apra member Anne Mayer. Ask the Ethicist: Oversharing Donor Information? How should one deal with a fundraising volunteer who overshares donor information? The Apra Ethics & Compliance Committee weighs in. In honor of Apra's 30th Anniversary, the Connections team has reached out to Apra members who have dedicated years to the organization, and asked them a few questions regarding all things Apra: past, present and future. This week, hear from longtime Apra member Christine Mildner. In honor of Apra's 30th Anniversary, the Connections team has reached out to Apra members who have dedicated years to the organization, and asked them a few questions regarding all things Apra: past, present and future. This week, hear from former Apra president Michael Quevli. Apra’s Data Analytics Symposium: Analytics that Work for Me! This year’s Data Analytics Symposium, held during Apra’s Prospect Development 2017, offers a wide variety of sessions for analytics professionals. Here, I share my journey with analytics – including my lessons learned – and how the symposium can help you with yours. Is it ever appropriate to share donor information with colleagues outside of your organization? The Apra Ethics & Compliance Committee weighs in in this first in a series of columns titled "Ask the Ethicist." 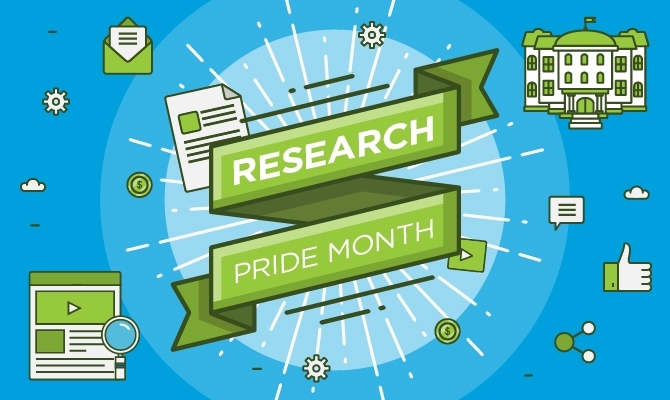 March is Prospect Development Pride Month, and boy do we have a lot to be proud of. .. We are actively motivated to learn something new every day. And we are generous in sharing tips, methods and resources with each other. Jennifer Peplinski was “flabbergasted and surprised” when she learned she had won the Apra Scholarship — so surprised, in fact, that she woke her dog as she worked from home. “I am very flattered to win this award, but really, everything we do is a team effort,” said John McBride, associate director of prospect research at the University of Chicago and recipient of Apra’s 2016 Professional of the Year Award. Enterprising, skeptical and communicative: These are three words that Jessica Balsam, associate director of prospect management at the University of Washington, uses to describe herself. Katie Ingrao, assistant director of prospect management at Rush University Medical Center in Chicago, is this year’s winner of the Margaret Fuhry Grant. The award recognizes her leadership, mentoring, volunteer spirit and dedication to professional development. Recent research has illustrated the insidious effects of prolonged sitting and sedentary behavior, including obesity, type 2 diabetes, cardiovascular disease and increased mortality risk. Prospect development professionals are not born, but made. Here are some of the educational opportunities currently offered that could benefit you and your colleagues. The [advocacy] committee is committed to implementing Apra’s strategic vision to raise the profile of our profession and empower prospect development professionals to take ownership of their critical role within the fundraising industry. When I joined the University of Wisconsin-Milwaukee (UWM) Department of Development in 1980, it was a very different place than it is today. Who, you might ask, was Margaret Fuhry, and why has she been memorialized by this award?